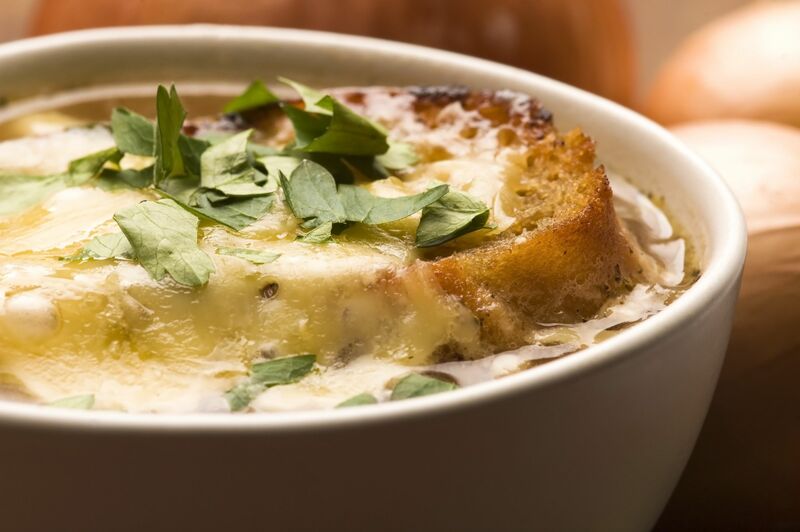 The slow cooker has never let us down and this slow-cooked French onion soup is no different. We threw the onions in there ahead of time to caramelize, then we poured in the remaining soup ingredients and let the cooker work its magic…then we added the toasted bread and cheese, stuck it all under the broiler and unbuttoned our pants so we could chow. down. Get ready, ‘cause this soup is about to rock your world! Optional: line slow cooker with disposable lining. Place chopped onions in slow cooker and season generously with salt and pepper. Drizzle butter and olive oil. Cover and cook on HIGH for 30-45 minutes, or until onions have started to caramelize. In a small bowl, whisk flour into balsamic vinegar and Worcestershire sauce and mix until smooth. Uncover onions and pour in beef broth, flour mixture and bay leaf. Stir everything together and recover. Reduce heat to LOW and cook for 6-8 (or on HIGH for 3-4). Ladle soup into oven proof bowls, top each with 1 slice of bread and a healthy dose of grated cheese. Place on top rack of oven and broil for 3-5 minutes, or until cheese is melted.